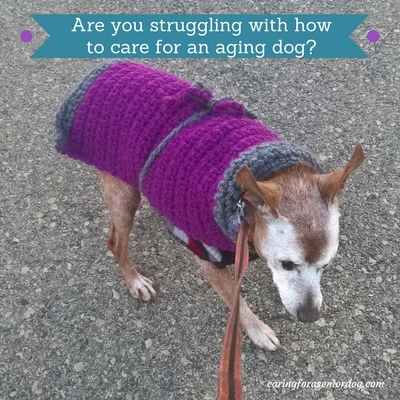 If you are struggling with how to care for an aging dog, it’s time you and I had a chat. Overwhelmed with our dog’s health issues, struggles with having to say goodbye and the financial strain of high vet bills can all overshadow the pure joy of living with a senior dog. a shelter and knowing the last weeks, months or even years will be their best ever. When you take your dog out for a stroll even if he’s slowing down, marvel in the sheer joy of him still being able to enjoy the great outdoors. When he’s resting on his bed smile at how gorgeous and peaceful he looks. When you’re sitting around together, remember the years of love and companionship he gave you, and the good and bad times you shared together. It’s perfectly normal to get impatient at times but try and move past that quickly and remember – showing kindness and compassion to these wonderful creatures who brought so much joy into our lives over the years, is what it’s all about. This is going at the top of my tips because of its importance for senior dog health. I believe in continuity of care, seeing the same vet each time whenever possible. Differing opinions from various vets on the right way to treat Red is not acceptable. Whether you’re falling out of love with your current vet or moving towns, cities or countries and need to find someone new, these tips will help. This is crucial because, unbelievably, I have encountered a couple of vets who didn’t have the most compassionate views about old dogs (and I assume that extended to old cats as well). Okay, they never came out and said “we don’t believe senior dogs are worth caring for” but their attitude said it just the same. How many years of experience practicing veterinary medicine will give you confidence in his or her abilities? Do you need to “click” with your vet, or are you happy enough for him/her to have the necessary experience? Personally I have to have a connection and be comfortable, but that’s just me. more treatments, how would you feel about that? I’ve been there and it’s not a situation I plan to find myself in again. Would you have to take time off work because they don’t have early opening, late closing or weekend hours? What type of medicine would you like to see them practice? Are you “traditional” all the way, won’t do anything that isn’t natural and holistic, or would you like a bit of both? Veterinary practices can be 1 man or woman operations with a small staff and some basic testing done on premises, to super hospitals that can rival the best human medical centres. My vet in Toronto was a one woman operation with all the basics needed and she was wonderful. I’ve been to a super hospital in Florida where I felt my only purpose was to help them pay for their expensive equipment, and a multi vet practice in England with an amazing vet who has done wonders for Red. 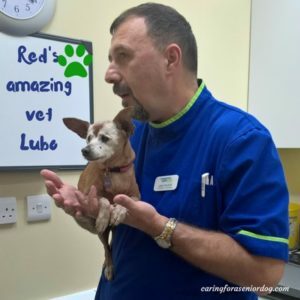 It’s up to you to decide whether your practice has to have more than the basics in house, or are you okay going to a specialist hospital should your dog need something like an MRI or complicated surgery for example. I often hear guardians talk about their dog’s issues, dismissing them as nothing more than a natural part of aging. That attitude worries me because some changes are due to illnesses that will go untreated, leaving their dog to suffer. They could be signs of anything from dementia and kidney problems, to loss of vision and painful joints. Any changes in behaviour, no matter how slight, should warrant a trip to the vet. The sooner it happens the better the odds of treating, or at least managing the condition. 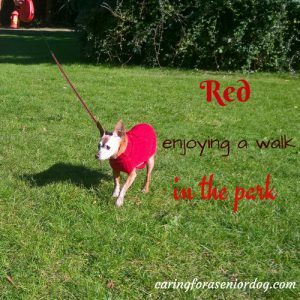 Senior dogs can definitely feel the cold more quickly and easily than younger ones, and that is certainly the case with my sweetheart Red. She is approximately 15 ½ years old, has short hair and spent most of her life in Florida. Now that she’s living in a cold climate she’s feeling it, so I am diligent when it comes to keeping her comfortable. months of the year. When we go out I add a coat on top of that. Be sure there are no draughts where the dog beds are, and if they are on a tile floor a piece of carpeting or even a blanket underneath will add a layer of warmth. A blanket on every bed is also a good idea, not only for added comfort but warmth as well. If Red ever feels chilled she wraps herself in a blanket. We all have different “cold” tolerance levels, and if you’re happy with the heat turned down low and wearing a couple of sweaters that’s great, but what about the dog? Either turn the heat up in the room she sleeps in or add a small heater. She probably doesn’t have that same tolerance level you do. Your dog needs grooming no matter the month on the calendar, but don’t clip him too short in the coldest months, and don’t forget that sweater. Just as you would child proof a home to keep kids safe, have a look around yours and see what can be done to keep your senior dog free from harm. It’s good to know even small changes can make huge differences. Keep your floors free from clutter as even the smallest toy or shoe could cause your dog to stumble or injure himself. Raising food and water bowls off the ground will be more comfortable, especially for big dogs that have to strain their neck to reach the floor. Red is a small little dog but I found that she’s happier when I elevate her food bowl. Ramps and steps for climbing onto the couch or into bed makes things safer for your dog, as jumping on and off could cause injury. If you have a large dog, or you have trouble lifting a dog of any size, a ramp is a great help for getting them in and out of the car. Your dog may be less tolerant of noise and activity then he used to be, for that reason a bed in a quiet area may be appreciated. I love a warm house in the winter, yet I know people who don’t seem as bothered by the cold and even keep a window open. Think about your dog who may not be as keen and keep the area where he hangs out warm. she gets cold. Think about a bed that is easy to climb into with the front lower than the other sides. Extra padding or orthopaedic memory foam are also good choices as they feel good on stiffer joints. Deciding on what to feed your dog is a little more involved than just choosing a senior dog food brand. Actually, who says a senior has to eat senior! I don’t believe there is a “one size fits all” solution when it comes to any dog’s nutritional needs. I do believe it’s important to educate ourselves about the types of foods available as well as how to interpret an ingredient list. Organic, all natural, grain free, canned food, dry food, freeze dried, raw… What!!! Another thing to add to the mix are the differing opinions on what the best food is. Some vets believe it’s raw, others are convinced condition specific food is the way to go. Some “experts” claim a specific brand of dry food is the best thing you can do for your senior, while others say dry is nutritionally dead. 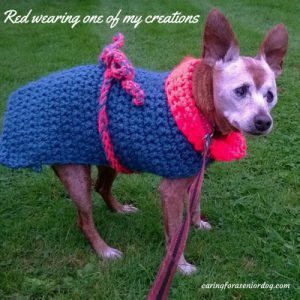 I recently started taking Red to a holistic vet for two reasons. I believe in the holistic philosophy of treating a whole being not just the “problem,” and she has been taking so much medication for quite some time, I was worried how her little body was able to process it all. For several years she was on a prescription diet, first a heart formula then kidney. I was unpleasantly surprised by the ingredient list and couldn’t understand how her nutritional needs were being met. My vet honestly believed her kidneys were doing really well as a result so I couldn’t argue with that. I have no problem questioning, but this vet is so amazing and did a wonderful job of caring for Red, I totally trust him. Two months ago we relocated and needed to find a new vet, and yes I found a holistic practice. A 45 minute serpentine highway drive is hardly convenient, but it’s worth it. He was very sad by the amount of drugs Red was prescribed, and not a fan of the prescription food. He took blood tests, and based on the results created a whole foods recipe tailor made for her. It consists of very specific amounts of chicken, brown rice, quinoa, olive oil, broccoli, raw carrots and raw apple. She loves it!! The best advice I can give you is research and find what makes sense to you. Get your vet’s view of what to feed your dog, then ask why he’s recommending a particular brand or type. Bear in mind not all vets are as well versed in nutrition as you’d expect them to be. If you’re intrigued by my situation and Red’s whole food diet, find a holistic vet and have a chat about their views on nutrition. Go with who you trust and what makes sense to you. I also believe in the use of supplements, alternative therapies and a holistic approach to health care. It may sound farfetched to some, but there are too many success stories to ignore this branch of veterinary medicine. Many holistic vets will be happy to set aside some time to explain their philosophy and approach to health and wellness. It can’t hurt to have a chat, but it’s entirely up to you. to mention the pain your dog is already likely experiencing. If you’ve notice these or other behavioural changes, make an appointment to see your vet right away. It’s quite possible the only course of action by this time will be dental surgery. 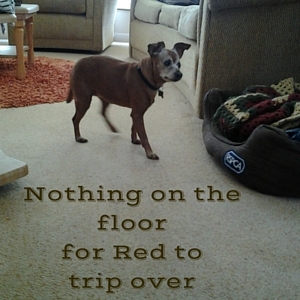 I know it’s not what you want for your senior dog, I certainly didn’t want it for Red, but doing nothing is often much worse than going ahead. Once your dog’s mouth is cleaned up you can prevent future problems with these supplies: toothbrush, toothpaste, water additive, dental chews/bones, toys and regular dental checks. If your dogs are difficult like mine, brushing will be a challenge if not impossible. I’m not trying to discourage you, but rather to let you know it’s not an unusual occurrence. Don’t give up after one try or one brush. For Red the only thing I’m able to get away with is gauze wrapped around my finger, with some tooth gel on it. She’s blind so I think it’s a scary procedure for her but I manage. Toothpastes come in various flavours and consistencies, including a brushless formula so again, trial and error. Additives for your dog’s water bowl will help freshen breath, some even claim to prevent tartar. Don’t rely on them as your sole dental care plan, but in combination everything helps. Dental chews and raw bones are other options some people swear by. Look at the ingredient list of the chew and if it’s the length of your arm and you don’t understand most of what’s written, walk away. I recommend speaking to your vet before you give your dog a raw or even cooked bone. Some chew toys are braided rope, others ribbed rubber or sturdy plastic. What’s great about toys over chews – no calories! Keep things interesting by rotating them. I can’t understand why some people don’t think old dogs need to be groomed. They leave their dogs with matted fur, long nails they can barely walk on and smelling rank. All dogs need grooming…period! As a dog ages, going to the groomer can become quite a stressful event – failing eyesight, the pain of arthritis, disorientation due to dementia or a host of other reasons. Perhaps a mobile groomer would be a better option. They park in your driveway in a fully outfitted van, and all the grooming takes place right there. If you’re having trouble finding a groomer, ask everyone you know who has a dog, including your vet and staff. Some of the large chain pet supply stores have groomers in house (or in store I should say), and because they work behind glass you can actually see how they handle the dogs. 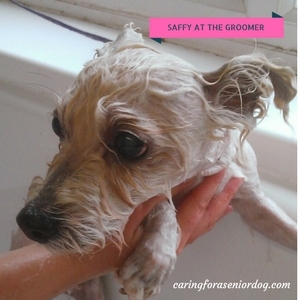 Not every groomer is comfortable or experienced with old dogs, especially ones who have issues. Yes I speak from personal experience on this one. What about bathing your dog at home, and letting the groomer (mobile or otherwise) do the clipping. That may help to significantly reduce his stress levels. If you’re feeling adventurous, learn the whole grooming process so you can groom your dog from start to finish in the comfort of your own home. 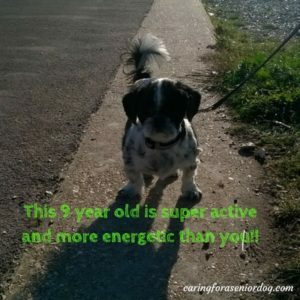 Of course senior dogs need exercise, and the type, length and intensity will depend on what shape he’s in! I meet tons of older dogs running like the wind, but if your dog is on the slower side there’s still plenty he can do. a game of fetch in the house. Tossing a ball or rope a very short distance across the room, or hiding behind a curtain in the same room your dog is in will get him moving just a bit, and provide some fun as well. Have a chat with your vet and ask what he thinks before you start anything new. In my experience, most pet parents I meet are unfamiliar with what mental stimulation is. Simply put it’s about keeping your dog’s brain active, which can stave off boredom, drain energy and perhaps even delay, lessen or prevent dementia. It’s especially important when the weather is bad and they aren’t able/willing to go out as much as they should. It’s easy to do, doesn’t have to cost a penny and should be included in your dog’s daily routine. Grab a muffin tin, hide a treat in a few of the cups, put a tennis ball in each then watch as your dog pushes out the tennis balls to get the treats. Use low calorie, homemade or fresh food treats. Grab a cup your dog can knock over, but not too easily. Hide a treat underneath then say “find it.” Increase the challenge by adding another cup, than another. I use three. Teach him the names of toys. Pick one (a pig for instance), hold it in one hand, say the word pig and as he grabs it give him a treat. Repeat and repeat until he gets it. Now put it on the floor and say pig, reward when he picks it up. Try it with another toy going through the same process. Then have both toys on the floor and ask him for the one you want. Do this training in short blocks of time so he doesn’t lose interest. If you’ve never taught your dog to sit, now is the time. If you have, find another trick to teach him. like ramps, steps, slings, dog wheelchairs and pet strollers. A sling, for example, can be very helpful for extra support while on a walk, and rolling a stroller with you means your dog can stop when he’s had enough yet still enjoy being outside with you. Steps are such a big help for getting on and off furniture, and ramps work well for beds, cars and even boats. As most of us know, saying goodbye is the absolute worst part of sharing our lives with dogs (any pets of course!). It’s so heart breaking I’ve met many people who will give up the joy of a furry companion, because they cannot cope with the loss. It’s normal to be devastated and we all need time to grieve, but we also have to be cautious of not sinking into a deep depression we’re having trouble climbing out of. Support from people who can truly relate is everywhere, so please don’t look for comfort from those around you who aren’t shy in letting you know “it was just a dog.” Finding it is as easy as typing “pet loss grief support” into your search engine, to locate both local and online resources. Many shelters run bereavement groups so check locally. If you can’t find something in your area, consider starting your own group. It may be therapeutic for you, honouring your dog in such a significant way, while helping others. There are many other things you can try to help you cope –an engraved memorial stone for your garden, a beautiful urn that takes pride of place in your home, creating a scrapbook of memories or writing a poem to name just a few. I always have a terrible time getting over a loss, and one time in particular was especially rough. One thing I did was light a virtual memorial candle and that did give me comfort. On my website in general, and this post in particular, I have shared a lot of what I’ve learned over the years. Sometimes they’re tips or tricks I’ve discovered and other times they’re just musings on my own experiences. I have struggled at times with the stress and worry, but I always remember to take a step back and focus on how much I love Red and the seniors who came before her. I feel blessed to adopt old dogs and to share their last weeks, months or years with them. Sometimes I will take a moment to watch how peaceful Red looks when she’s sleeping, and nothing matters but the love I feel for my sweet sweet girl. 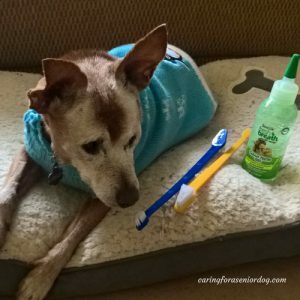 If you’ve been struggling with how to care for an aging dog, I sincerely hope this post has helped in some way. If you have any questions, a story to share, need advice or just someone to talk to, please contact me and I will do my best to help in any way I can. Send me a private message, post a comment below or on my Facebook page. I do look forward to hearing from you. 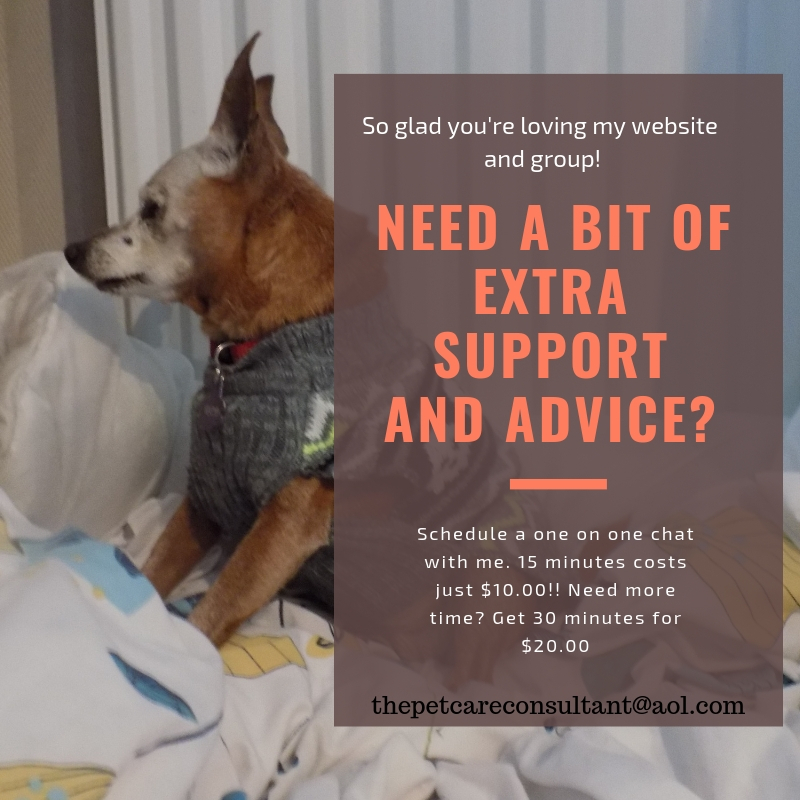 Awesome post about caring for senior pets. I believe in finding a vet that works well with you and your pet and meets their needs. Senior pets have so much to give and there is no reason they can’t still enjoy life. Thank you Kelly. They certainly do have a lot to give, it always made me sad to see them passed over in the shelter in favour of puppies. For me the key to keeping Red with me is having an awesome vet who doesn’t panic under pressure, is an excellent clincian and has Red’s best interests at heart. I would never compromise on her care. Thank you Amy. 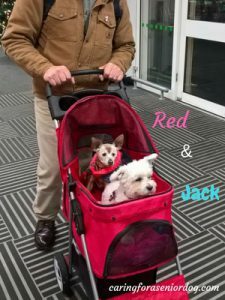 I never tire of writing about seniors, or hoping more and more people will see them as amazing companions and consider adopting when looking to welcome a new furry family member. This is a great post and one that every owner of a senior dog should read. We have a senior dog and can identify with much from this post. One of the things we’ve noticed over the past few months is that he’s hard of hearing now. Thanks Rachel it’s nice to hear. I know how hard it can be to witness changes, but seniors will always have my heart…and soul! Thank you Tonya. 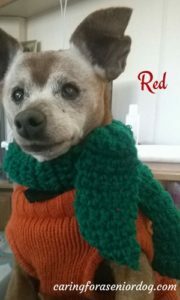 I’m thrilled I am finally in a position to have Red cared for by a holistic vet. When he heard she was eating a prescription diet for her kidneys he was so sad. I remember being convinced that dry food was the way to go, it was great for their teeth… then you read about how nutritionally dead it actually is. What was new for me was having a vet that didn’t recommend a prescription diet but actually created a recipe tailor made for my dog, based on blood tests he did. I’ll tell you what, Red went through a period where she seemed to be losing her appetite (of course not eating and Red is enough to scare the crap out of me), but that hasn’t been a problem on her new diet. She’s loving it!! 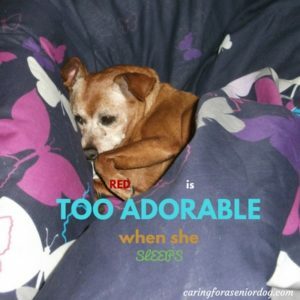 This is a very comprehensive post about senior dogs! I’ve been lucky enough to have loved a few dogs from puppyhood to old age. The last dog I adopted was about 5 when we adopted him, and I will consider a senior dog in the future. Red is so lucky to have such a good caretaker in you! I’m so glad you think so, and believe me I’m the lucky one to have found Red. I love her more than I can ever express, and can’t imagine my life without her. Red is the first dog I’ve had for years (7 1/2 to be exact), all my other seniors died anywhere from 3 days to 2 years after I brought them home. I have a real soft spot for them. It must be something to share your dog’s whole life with them – that’s very special. Bless you for adopting senior dogs and caring for them. I’d like to do this for cats! My family did once buy two puppies. Seeing them grow old was an educational experience. Yes, finding the right vet is important. I should have gotten a different one for our guinea pigs. With our first cat, we found the perfect one and have stayed with her. Over the years, I’ve gotten better at understanding the needs of older animals. Our dog gets lots of check-ups, medications, blankets, and massages. He also gets more pampered in those unlit areas that make things harder for him to see. You’ve written quite the impressive guide! Thanks for passing on your knowledge. I have a soft spot for the oldies, I don’t know why it just happened. The next cat I get will be a senior as well. It must have been quite an education living with a dog for their whole life. Understanding the needs of older animals is a definite learning curve, and you discover new ways to care for them all the time. Sounds like your dog is really lucky with the amazing care you’re giving him. Thanks for sharing Allison. Wonderfully thorough post! I kept saying “I know right! ?” so many times while reading this post. You’ve said all the things I feel about senior dogs & much more. I’ve had puppies in my life but Phoebe was approx. 3 to 5 years old when I adopted her. She’s a senior now at 8 years old. I really would love to adopt a more senior dog next time, give a loving home to an 8 or 10 year old canine citizen so they can live their final years with love, dignity, and quality of life. They deserve to feel like they are still appreciated and valued. That’s a beautiful sentiment Cathy. I can’t imagine a more compassionate thing to do than give an old dog a home. It breaks my home how often they are overlooked in shelters, and too many die alone without a home of their own. To include a senior dog in your family, and make his last days, weeks, months or even years as full of love and care as possible is incredible. Layla just turned 10, she goes to the vet twice a year. As a PAWS client I am blessed to be part of a program where they have a vet on Saturdays for free for what they call Ask the Vet so when I need her nails done, etc I go there. She thank goodness is very healthy for her age but I am keeping an eye on her. Thanks for the great info. Hi Ruth, I’m not familiar with PAWS, but it sounds like a wonderful program. Glad to hear Layla is doing so well. Oh I’m sharing this broadly and think you should approach vet hospitals about sharing this post. As you know seniors have a special place in my heart and our 13 year old doxie is getting kind of eccentric. His feet are having some issues and his sight is going a little so I have to be very patient with him. I think about his age and how precious this time is and my heart breaks a little. Thanks for sharing Christine, I appreciate that. I hadn’t thought of approaching vets but it’s a wonderful idea. Whatever helps parents take better care of their older companions I’m up for. You’re right about patience, and it is a great lesson for us. I’m in denial about Red’s age because I can’t imagine life without her. I’m only had her 7 1/2 years but I feel like she’s been with me her entire life. I think our biggest challenge will be keeping him warm … but we have at least 6 more years before we need to worry! It’s not only Red that feels the cold but our younger dog Jack does as well. Wherever we’ve lived with Red, even though it’s been cold it hasn’t been too difficult keeping her warm. The one place I won’t live with her is Canada in the winter. We’ve been there visiting in the winter and she suffered terribly. No amount of sweaters and coats can keep her warm outside. Every single one of your tips is right on. I wish our pet owners would read it and be so responsible. I spent several years caring for my chronically ill dog. I always enjoy your blogs and tweets! Thanks Molly, that means a lot for me to hear you say that. I wish more pet parents would be responsible as well, especially when it comes to seeing old dogs as deserving of proper care and attention as younger dogs. This is a lot of great information. Luckily my two last dogs lived very long healthy lives right up until the end and Kilo is 4 and healthy so far. However, I will certainly share with people needing help with seniors. Thanks for sharing, I appreciate that! For some reasons people associate the words “old dog” or “senior dog” with “almost dead dog” and it drives me nuts. Age is a number and by no means a guarantee things will start to go terribly wrong. Plenty of dogs, such as yours, live long happy and healthy lives until the end. I love your post – seniors require compassion and empathy, as we will all (hopefully) be there some day. What I love about seniors – they make you slow down, be intentional about how you are loving (not just that you are loving) in a way that is more selfless, more focused on the pup. They truly understand when you are doing your best for them. One thing we added with our seniors is acupuncture – we found it really helped them with aches and pains and delayed some aging signs (stiffness, energy levels, breathing, etc.,). Thank you for all you do! I’m so glad you enjoyed it Rebecca. Seniors definitely teach us important lessons, but I had never thought of selflessness before. It makes sense since I feel like my main goal in life is keeping Red happy, healthy and comfortable and I can’t imagine it any other way. Red started acupuncture last week, and tomorrow she’s going for her 3rd session. She doesn’t seem to have any aches or stiffness, but my new holistic vet likes to take a multi pronged approach. In addition to the whole food diet he created for her, he has replaced some of her medications with supplements and introduced acupuncture to help her get into balance. It will definitely be interesting to see what changes over time. It’s nice to hear how much acupuncture helped your furbabies. what a wealth of information about senior dogs and the appropriate care. 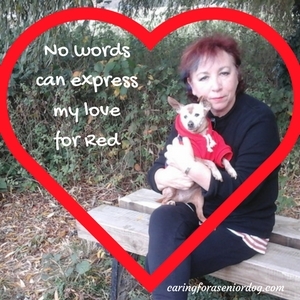 Thank you for your continued passion for senior fur children. Thanks I’m glad you think so. Seniors are my one true passion, I’m just feeling pet parents of senior dogs aren’t paying much attention to the wealth!! Thank you for sharing this thorough, informative and heartfelt post. I am pinning this great resource. Thanks for doing that Sadie, I appreciate it and hope it helps others.